George Carlin called him "funny and smart"--very perceptive man. 16. I Love This Game! 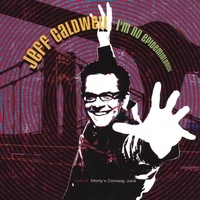 Jeff Caldwell is known to audiences nationwide as a clean, clever comedian with one of the brightest standup acts around. Whether at a comedy club or a corporate event, Jeff delivers smart, funny jokes on topics ranging from the daily news to the daily grind, subtly tailoring his material to fit any crowd. CBS got wise to Jeff, scooping him up to develop his own sitcom. He's appeared twice on "The Late Show with David Letterman," made his third appearance on "The Late Late Show with Craig Ferguson" and made his Comedy Central debut on "Live at Gotham." Jeff also makes appearances on national news and political talk shows, on XM Radio, and is a regular on the nationally syndicated "Bob and Tom" radio show. omg - this guy is so funny. Not many people can pull off humor, likability and intelligence all in one package but Jeff Caldwell delivers. He is hilarious, engaging and this C.D. is a definite must-have. I can see it being played again and again. It makes me want to take a road trip so I can pop in Jeff Caldwell into my car cd player and laugh the whole way home. Can't wait for more from Jeff Caldwell!! While listening to the comedy channel (XM Radio) on a recent cross country trip one night, I discovered this brilliant act. I was laughing so hard I almost drove off the road during a rainstorm in Tennessee !! What a great style; and for me reminiscent of the brilliant Robert Klein....even the voices are similar. Jeff, whatever you're doing...Don't stop Brother. By the way, my gold bars are still stuck in Nigeria..can you help me out..??? Jeff's humor is refreshing; it allows the listener to easily identify with the many offbeat ideas. Typing the title reminds me of a high school typing test. The content soothes the soul in a very sick world. Jeff could take over Leno's or Conan's spot. He's even funnier. I laughed till I cried-the man is brilliant. Can't wait for his next CD.